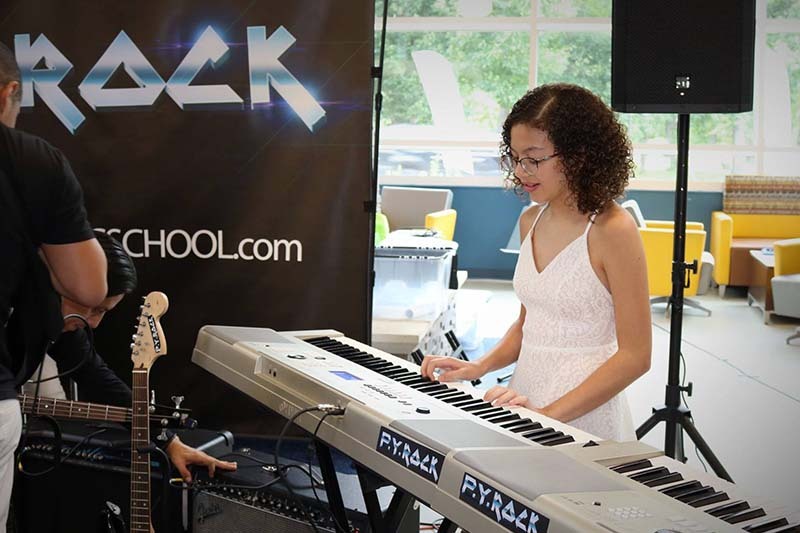 Music Lessons in Elizabeth, NJ | PY Rock Program "
PY Rock music lessons are designed to give motivation levels to students that parent never believe possible. Through private music lessons and group music lessons students learn foundamental aspects of the instruments in a dinamic and fun way, this combination keeps the student looking fordward to their next lessons. Our primary goal with our music lessons is to inspire the students to learn and help them reach their individual goals. Through our band-based music lessons, students get motivated to do their practice, and with the help of our music instructors, they become more confident on stage and in life. At PY Rock, we design our music lessons in a way that our music instructors can be flexible with the type of songs they use in every music lessons. The reason we do it is because that way, students look forward to their music lessons and to their practice at home. Students start with private drum lessons so they can focus on fundamental habits. Learning how to hold the drumsticks correctly, body posture and basic music notation are part of the first music lessons, and working on those topics on private music lessons is critical to developing good habits. After the music instructor decide the students are ready to another program, they start taking group music lessons. All of our singing instructors have a rich understanding of vocal techniques and of how to assist singers of all levels, styles, and backgrounds through their flexible music lessons. Music lessons with highly trained music teachers is a simple combination that automatically increases the chances for the student to succeed in music. Choosing the right music school to take music lessons is a very important desition to make. We have private lessons and group lessons for kids, teens, and adults. Over the past 8 years, our music lesson programs have helped students to reach whole new levels of music understanding. Not only the students have weekly music lessons but they also get the chance to be in a band, perform on stage and learn essential skills for life. It's hard to put into words how beneficial taking music lessons at a young age can be. Through the process of playing and exploring instruments with their music instructors, they develop new skills and get a solid foundation of music in general. By the time the student is able to maintain a repertoire of songs (taught by their music instructors on private music lessons), he or she is putting into one of our PERFORMANCE PROGRAMS which opens up a whole new world of learning, friendship and fun!. They move from private music lessons to band practice!. At that point, they are able to apply everything they have learned in their private music lessons to a real musical context and then perform their songs for friends and family on the stage with professional sound, lights, and fog! We offer classes for kids, teens and adults. This is how it all happens: The Students get full attention on their first steps through our one on one private classes and then after they are ready to rock, they are put into one of our school bands to perform on stages where we believe the great lessons are; confidence, self-steen, techniques, rhythm and fun they all sky rocket!.